We arrived in Punta Arenas, about an hour late, not sure why. We were up at 5 AM, if we had known we were going to be as late as we were we could have slept more and that would have been good. As we needed all the energy for what was to come. We finely boarded, our tender about 9AM, and then a long walk to the bus. When we got on the bus, our guide was so excited to tell us that we had a GO!!! Now our hearts were really beating,,, we drove to the Airport and after some confusion about where we were going, we boarded our plane. A nice little BAE 146 200. There were 44 of us. Ed and I had a nice seat up in the forward part of the plane with no one in the middle seat, heaven. We arrived Antarctica about 11, landing on a gravel runway, the pilot kissed the runway on landing, I didn’t think that was possible on a gravel runway, but he was good. 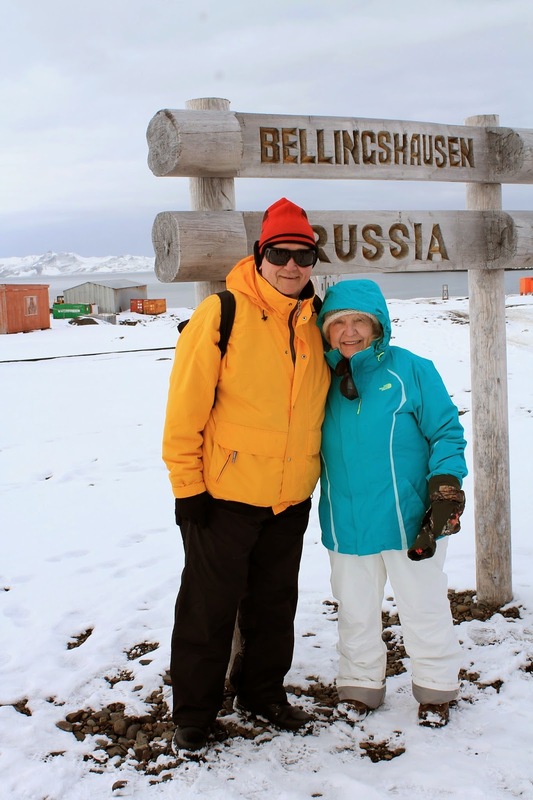 After debarking, we walked down the runway, and down to the area that was the Russian area where we broke into groups, of 15 to go to the Zodiac's to go to Ardley Island to observe the Penguins and antarctic wild life. It had just snowed two days before so the walk was heavy, but we had made it to ANTARCTICA!! Wow how about that! It was fabulous, and we will have many stories to tell, for years to come. So I will show you some photos, that tell a lot. Wow we are really here! Now it was on to see the Penguins. The birds were trying to take this penguin out, they are vicious! WOW!!!! That is so amazing!!! What an awesome adventure! I'm so glad you could go! Al & I are so excited and glad that you made it to Antarctica! I can't wait to hear more about it when you get home. It looks as cold as it is here. we got snow too (in late march if you can believe it) love the pictures. You should record some of your stories while they are fresh. Do it in video mode on your camera or an audio file on your MAC.